Plovdiv, South Central Bulgaria, September 14 (BTA) – Opening the 12th two-day Arraiolos meeting of EU state leaders at Plovdiv’s Ethnographic Museum, President Rosen Plevneliev said the main goal is not to allow Europe to plunge into a crisis of values and a lack of solidarity and unity. “Whether we talk of migration or security, we should stand shoulder to shoulder,” he said. The following heads of State are visiting Bulgaria at Plevneliev’s invitation: Germany’s Joachim Gauck, Italy’s Sergio Mattarella, Latvia’s Raimonds Vejonis, Malta’s Marie Louise Coleiro Preca, Poland’s Andrzej Duda, Portugal’s Marcelo Rebelo de Sousa, Slovenia’s Borut Pahor, Hungary’s Janos Ader and Finland’s Sauli Niinistoto. The Presidents of Austria and Estonia are also taking part. This top-level informal forum for political dialogue was first held in the Portuguese town of Arraiolos in 2003 on the initiative of then President Jorge Sampaio. It brings together the EU heads of State who do not represent their countries at the European Council. 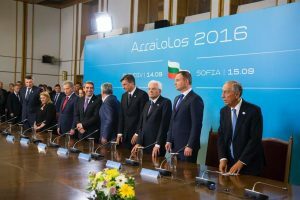 Bulgaria joined the Arraiolos Group at the invitation of Poland and Portugal in 2013, and was chosen unanimously to host the 2016 meeting at last year’s forum in Germany. The Presidents of the EU’s parliamentary republics will discuss the future of United Europe and the Balkans, as well as the challenges facing the EU: the migrant crisis, counter-terrorism, and post-Brexit Europe. Plevneliev said: “This is not a time for national egoism, and none of the crises can be handled by a nation-state. The only sustainable solution to each problem is an all-European solution. The Bulgarian President said that 11 crises are unfolding simultaneously in the EU, the moral crisis being the most dangerous of all. It is manifest in questioning of the European values and a lack of solidarity and unity, which are needed to achieve sustainable solutions. “Today Europe is confronted with more problems than ever since World War II and regrettably, at this decisive moment the EU seems to be weak and divided,” he said. Nowadays EU citizens take peace and open markets and borders for granted, but are concerned about migration, terrorism, unemployment, red tape and the plummeting representativeness and legitimacy of political elites and the loss of national identity, Plevneliev also said. The migrant crisis has led to a new divide in the EU and dependence “on the gatekeepers of Europe, including Turkey, Egypt and Libya, is growing,” triggering the rise of European populist and Eurosceptic parties, which limits the possibility of making common decisions, the Bulgarian head of State warned. The President added that at a time when nationalist parties are feeding people’s fears and are gaining impetus, and hate, racism, xenophobia, populism and aggressive nationalism are on the rise, “we should show the strength of our values and unity”. “The EU is above all a union of values. If the values go, we will be left with just geopolitics and interests. If we stay within geopolitics and narrow national interests, we will revert to the 19th century,” Plevneliev said and called for strengthening the European institutions’ capacity for crisis resolution.